To ensure honesty and fairness, the games found at select online casinos are audited each month by one of the world's biggest accounting firms. 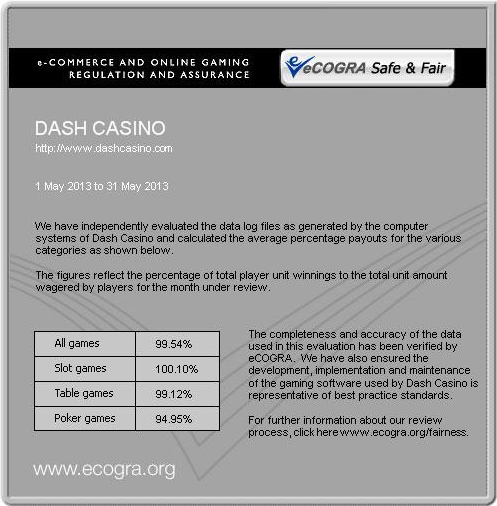 These monthly payout reports represent the total monies returned to players expressed as a percentage. The higher the percentage for a given audit period, the more was paid out to players. With a quick look at our rankings, you may see which casino has recently paid out the most to players for all games, and also by type of game, including: Slots, Table, and Poker Games. The casinos featured on this page do not currently allow play from the United States. For a list of casino sites that accept US players, please visit the US Online Casinos page. Find great game variety and consistently high payouts at one of the internet's premier casinos. possible once the reports are available. Enjoy a favorite casino game on the go with a cutting edge mobile casino. Find a preferred place to play with important details for each of our officially recommended online casinos. Try your hand at over 225 different slot machines, video pokers, and table games in our free casino games feature. See which games carry the highest advantage for the house, and which ones offer the best chances for players in casino game odds. Learn about bets and basic elements of gameplay for popular table and card games in casino game rules. Browse winning pictures of popular slots and video poker games with commentary on each score in the casino wins gallery.